Brown, flattened and hungry for blood… Not, I am not talking about some dangerous predator, yet the bed bug can be considered like one in the insects’ world. With a history that goes back in ancient times, bedbugs have had enough time to produce up to 92 species of different ‘cousins’, all over the globe. •	There is one bedbug species that dominates the human environments: the mighty Cimex lectularius. You can easily recognize a bed bug by his reddish – brown appearance, oval shape and no wings. Pay attention though: even if they don’t have any wings, they run like Speedy Gonzales and you have few chances to kills them all at once. Why did I say ‘all”? The answer is very easy: female bedbugs can lay up to five eggs a day and an amazing 500 during its entire life. •	Eggs can be observed with the naked eye; they are approximately 1 mm in length. They are covered with a sticky substance that helps them adhere easier to the surface. Usually, bedbug female are laying their eggs in dark, protected places such as floor cracks, furniture cracks or under paper objects. As soon as the small bedbugs hatch, they must feed straight away. For a long time I believed that bed bugs were exterminated after the World War II, when the well known insecticide DDT was invented and widely used. However, it seems that in the past years, when the substance was banned, a new wave of bedbugs have taken over our world. Although bed bugs are harmless, like flees or muskets, their main food consists in our … blood. In case you don’t have a pet, you and your family are surefire victims! Bed bugs are little vampires – how do we recognize their bites? Just like vampires, bedbugs like to feed with the blood of humans or small pets during the night. Since they like to live mainly in bedrooms, they can hide anywhere, starting with your bedroom mattress and covers. This is why when we sleep; we turn into perfect victims for their feeding needs. The bedbug feeds for about five minutes then it crawls back into its nest. You will probable feel the bites several minutes after, because the bedbug injects his saliva with a special anesthetic that allows it to feed without being disturbed. 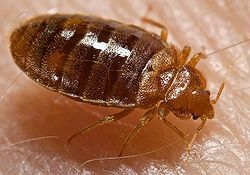 •	Although the bedbug bites are not dangerous to humans, they can cause an allergic reaction after being bitten several times. •	Bed bug bites can be easily mistaken with the bits of other insects who feed with our blood (like mosquitoes). The bites are grouped, sometimes in circles. If you check a bit the sheets or the pillows, you can notice immediately if you have unwanted ‘visitors’. A gathering of small spots, dark, the size of the poppy seed is the best indicator that you need to take care of the problem immediately. Do they choose us or do we choose them? Bedbugs are smart predators, because they can hide in our luggage, clothing or other belongings. In many cases, this is how they end up in our houses. If you like vintage furniture, also pay attention, because it may be infested with bedbugs. On the other hand, if you move into a new house, even if it seems clean, you might have to face some bedbugs in the future months. This happens as bedbugs can survive few months without feeding, and all they need is a brand new owner. Next post: what other bugs bite during the night other than bed bugs? and how do i get rid of them?